The hardreading staff gets it that Pennant Fever Grips Hub Tabloid (just check out pages 1 through 5, along with the actual Sports section). But then the feisty local fanzoid goes overboard. The guy has 24 saves. Lifetime. Including his five-out save Thursday night against the Detroit Tigers in Game 5 of the AL Championship Series — which, with Game 6 set for tonight at Fenway Park, moved the Red Sox to within one win of going to the World Series — Uehara has a 0.52 ERA, 24 saves in 26 chances, and a ridiculous 70-to-2 strikeout-to-walk ratio in 48 appearances since taking over as closer in mid-June. That’s a great year, no question. But then to start tossing in names like Eric Gagne (major-league-record 55 consecutive saves) and Trevor Hoffman (601 career saves, second-most all-time) seems a bit premature. And not to get all such-small-portions on you, but how do you do a whole piece on great closers and never mention Mariano Rivera – the greatest of them all – once? Chalk this up as a blown save. P.S. Before anyone says the piece is based on catcher David Ross calling Uehara great (“Yeah,” Ross said yesterday, “I’ve caught a lot of great closers in my career.” Koji Uehara? 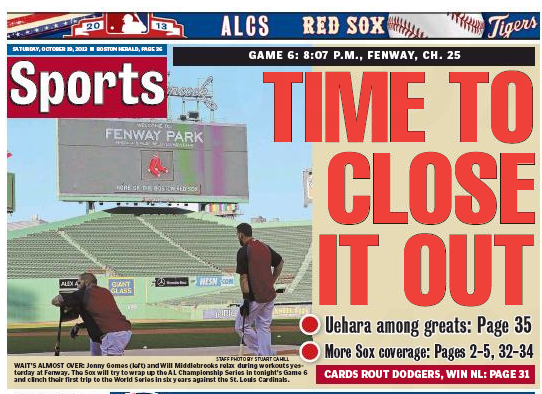 “Right up there,” he said, never hesitating), that means Uehara among greats should have been in quotes. Otherwise, the Herald owns it. This entry was posted on Saturday, October 19th, 2013 at 4:45 pm and is filed under Uncategorized. You can follow any responses to this entry through the RSS 2.0 feed. You can leave a response, or trackback from your own site. You crack us up, Mick. I dunno man. Maybe it’s flouting journalistic convention or something, but it’s right there in their lede. Argument form authority. So your “Herald owns it” seems pretty thin to journalistically naive me. As to the facts of the matter, if you took Rivera’s post-season career, he was better on average (over a sample size 10 times as large). So, no, not the best, even over a short stretch. But you really have to view things at face value, looking at the universe of closers Ross has caught – Gagne LA 04, Papelbon BOS 08, Wagner ATL 10, Kimbrel ATL 12, and Uehara. Papelbon’s 08 post-season was truly lights-out (7G, 10 IP, 3H, 0R). So Ross’s memory is hazy. Uehara’s the guy we got, though, and he’s been very effective. Sox in 5. Eye of the beholder, Steve. To me, the Back Page hed trumps the lede.